The biggest disappointment about the Fremantle Dockers football club wanting a pay-out to leave Fremantle Oval is not just their corporate greed, but that they don’t care about the community and don’t recognise the importance of the development of the oval for the WAFL and for Fremantle. Plans are to have the East Fremantle and South Fremantle footy clubs sharing the facilities and holding their home games at the oval, which would mean a weekend game at the oval every weekend during the footy season. The development of the oval and Stan Reilly site will also connect the Cappuccino Strip all the way to Wray Avenue, and part of the masterplan is to go back to the good old days where events and concerts were held at Fremantle Oval, so all that is of great benefit to the entire Freo community and would support two WAFL clubs. It appears the Dockers only have a narrow focus on the financial triple bottom line and don’t care at all about the Fremantle community, which has supported them for twenty years. That is a slap in the face. What also worries me is that the City of Fremantle does not seem to have added an exit clause in the lease contract in 1994 that would require the Dockers to unconditionally hand back Fremantle Oval to the City when they move their training facilities and HQ somewhere else. What did CoF pay its lawyers for when they set up the contract, I wonder? Where the COF officers and the lawyers really so naïve to believe the Dockers would remain at Fremantle Oval for 50 years? Why are the Minister for Sport and Premier Colin Barnett not getting involved and tell the Dockers management that their demands are disgraceful and unacceptable? Maybe it’s time for a name and shame protest event at the oval soon, so we can expose the disgraceful behaviour of the Dockers’ management in the national media. The Fremantle Dockers had another win and pushed out the West Coast Eagles to have a women’s team in the new national female AFL competition that will start next year. The ‘Delightful Dockers’ will join Melbourne, Carlton, Collingwood, Western Bulldogs, Adelaide, Brisbane and Great Western Sydney. Womens soccer has become a great success in Australia and around the world and there are already many female Australian Rules teams, so exciting times ahead. Go Freo Fantastics, or whatever they might be called. Only one more sleep and the Fremantle Dockers will be fighting Hawthorn at Subiaco Oval to try to make it to the Grand Final. 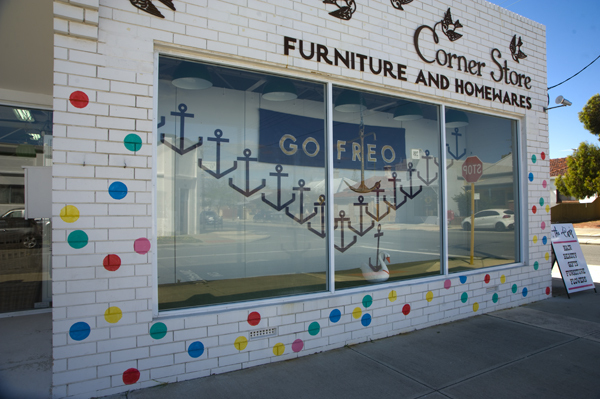 There is purple everywhere in Freo and the shops have done excellent window decorations. There is even a Dockers banner on the large crane above Atwell Arcade. Here a few photos I took of the footy madness. 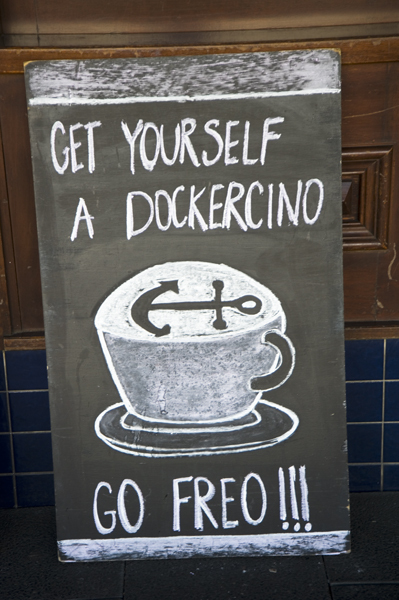 FREO TRADERS YELL GO THE DOCKERS! No one can accuse me of bias. With a heavy heart this West Coast Eagles supporter acknowledges the effort by local Fremantle businesses and promotes arch rivals Dockers. 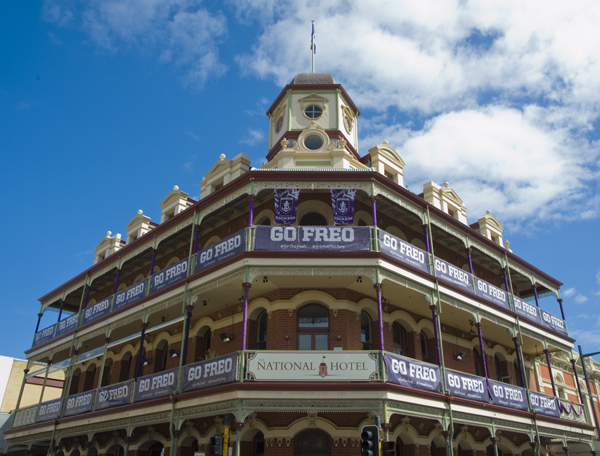 Clearly as someone passionate about Freo I hope the Dockers will win win, but should the Eagles and Dockers make it to the Grand Final I will be sitting on the fence and assume the best team on the day will win. What a cop out hey! 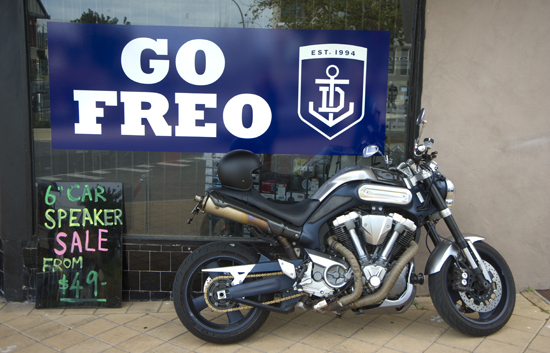 Comments Off on FREO TRADERS YELL GO THE DOCKERS!